Residents can also enjoy another session of Yoga in the Park in Cherry Hill on Saturday. Peach season has arrived and there will be multiple peach festivals taking place in South Jersey this weekend. However, if peaches aren’t your thing, there will be plenty of other events taking place this weekend. Check out what’s going on around the region. Residents can start their Saturday off with a fun activity at Barclay Farmstead. Another Yoga in the Park session will be held at the farmstead on Saturday beginning at 8 a.m. Participants should bring a mat and water. The event is free, but participants should register in advance at https://register.capturepoint.com/cherryhill. 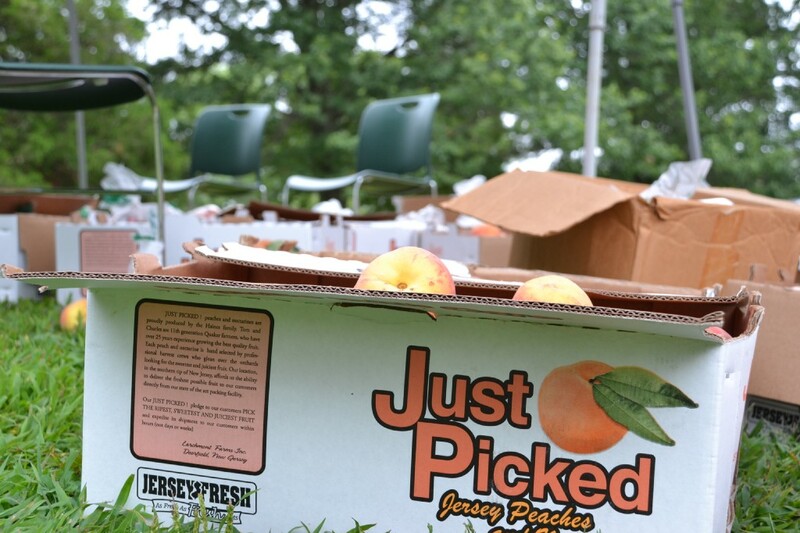 Peaches will be everywhere across South Jersey this weekend. In Mt. Laurel, the 26th annual Mt. Laurel Meeting Peach Festival is scheduled for Saturday from 4:30 to 7 p.m. The festival will be held at the Mt. Laurel Meetinghouse, located at the corner of Moorestown-Mt. Laurel Road and Hainesport-Mt. Laurel Road. Visitors can enjoy locally grown peaches and homemade ice cream and cakes. Tickets are $5 for adults and $3 for children. The event will take place, rain or shine. Peach lovers can also get their fix at an all-you-can-eat Peach Festival on Saturday at Richwood Church Fellowship Hall, 111 Richwood Road in Richwood. The festival will include homemade peach desserts and beverages with hot sandwich platters. There will also be a basket auction, bake sale, craft table and book signing. Tickets are $8 for adults and $4 for children ages 7 to 12. For more information, call the church at (856) 589–0874. Theater lovers can head down to Hammonton this weekend for the New Jersey Fringe Festival. The festival is a three-day event in the town’s art district where multiple theatrical productions will take place at a number of venues. There will also be a beer and wine garden, pop-up art, vendors, live music and more. A day pass costs $19 and a weekend pass is $39. For a full schedule or more information, visit http://www.eagletheatre.org/njfringe. An annual tradition returns to the Ocean City boardwalk this weekend. The 55th annual Ocean City Boardwalk Art show will be open from 10 a.m. to 6 p.m. on Saturday and 10 a.m. to 4 p.m. on Sunday. Leading artists from around the region will exhibit and sell their work along the beach and boardwalk between 6th and 14th streets. For more information, visit http://www.oceancityvacation.com or call (609) 525–9310 or (609) 399–7628. Crab lovers will want to be in Wildwood on Saturday for the New Jersey State Crab Festival. The festival will take place from 11 a.m. to 10 p.m. at the Ice House Restaurant, 4415 Park Boulevard, in Wildwood. Guests can enjoy bushels of crabs, a beer garden, music, activities and more. For more information, visit www.icehousewildwood.com/NJ-State-Crab-Festival.html. The ninth annual 2nd Street Festival will fill six blocks of 2nd Street in Philadelphia on Sunday. The festival will be open from noon to 10 p.m. between Germantown Avenue and Green Street. There will be plenty of food, live entertainment, vendors and more. The festival is free to attend. For more information and a full map of the festival, visit www.2ndstfestival.org. Christ Church in South Philadelphia will be hosting a Summer Festival on Saturday from 10 a.m. to 3 p.m. at Dickinson Square Park, located at the intersection of Tasker Street and Moyamensing Avenue. There will be a ton of activities, including games, a kid’s zone, zumba, and more. There will also be music and free food. For more information, visit www.christchurchsouthphilly.org/summerfestival.